If you turn to tea for a healthy dose of antioxidants, keep in mind that the antioxidants, or polyphenols, found in commercially bottled tea is up to 20 times less than you’ll find in homebrewed tea. Not to mention the amount of sugar. Me, I like good coffee and iced green tea. I drink plenty of both daily. I brew both very strong for two reasons. First and foremost I am all about ‘effect’. I want my chemicals in as concentrated form as possible. Second is flavor. I enjoy hearty flavors. I am not one taken by subtlety. 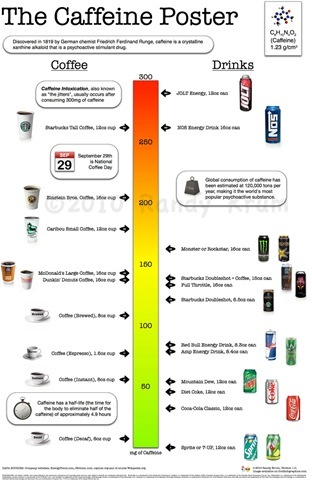 If you were ever wondering about caffeine content and what products give you the biggest bang for the buck check this out. Over at the frugality centered blog Wise Bread, they crunched the numbers on the caffeine content to cost ratio of 22 common caffeine sources. The king of the caffeine castle isn’t actually a drink. No Doz pills have a caffeine content that breaks down to a mere 0.0008 cents per mg. Uncomfortable outright acknowledging the necessity of your caffeine habit by turning it into a pill-popping habit? Fair enough, you’ll want to start drinking the runner up: Tetley’s Black Tea.